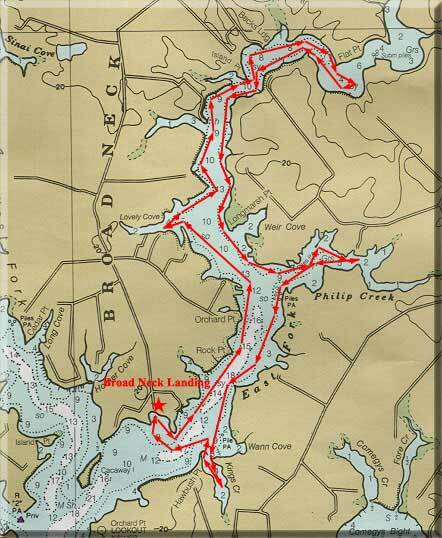 Leaving Broad Neck Landing, we'll paddle up the East Fork along the western shoreline, and into Lovely Cove, a popular and well-named destination. We'll follow the meandering creek along a densely wooded shoreline to a basin beyond Beck's Landing, where we make our turn. We'll return along the east shore as dense woods give way to upen fields. We'll paddle into Philip Creek, with its extravagent waterfront homes. Continuing down the creek we'll briefly enter small, secluded King's Creek before returning to our starting point at Broad Neck Landing.